DAVID M. COTE has been Chairman and Chief Executive Officer of Honeywell International Inc. since July 2002. Honeywell is a Fortune 100 company with headquarters in Morristown, New Jersey that invents and manufactures technologies to address some of the world’s toughest challenges linked to global macrotrends such as energy efficiency, clean energy generation, safety and security, globalization and customer productivity. Honeywell has four primary business units: Aerospace; Automation and Control Solutions; Performance Materials and Technologies; and Transportation Systems. Mr. Cote joined Honeywell as President and Chief Executive Officer in February 2002. 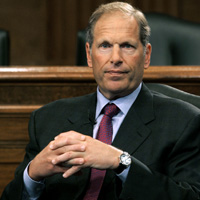 Prior to joining Honeywell, he served as Chairman, President and Chief Executive Officer of TRW Inc., a provider of products and services for the aerospace, information systems and automotive markets, from August 2001 to February 2002. From February 2001 to July 2001, he served as TRW’s President and Chief Executive Officer and from November 1999 to January 2001 he served as its President and Chief Operating Officer. Mr. Cote was Senior Vice President of General Electric Company and President and Chief Executive Officer of GE Appliances from June 1996 to November 1999. Mr. Cote served on the bipartisan National Commission on Fiscal Responsibility and Reform, the Bipartisan Policy Center’s Energy Project, and he served as Co-Chair of the U.S.-India CEO Forum. He received an Honorary J.D. degree from Pepperdine University in 2001. Mr. Cote is a 1976 graduate of the University of New Hampshire, where he earned a bachelor’s degree in Business Administration.